Yes, it is possible to get ROI from CRM. SalesProcess360 Founder Brian Gardner taps his decades of industrial sales experience to provide simple yet effective strategies to get the most from customer relationship management. In this book, learn to approach CRM as a system for leveraging knowledge throughout your business, and gain an edge with a revamped sales process and engaged team. ROI from CRM is published by Modern Distribution Management (mdm.com), the leading resource for wholesale distribution executives. Already have a copy and want to download your free resources? Click here. Learn how to approach CRM as a system for sharing and leveraging data and knowledge throughout your business, and gain a competitive edge in the market with a revamped sales process and an engaged team. This book will provide valuable insight for companies that are looking to implement CRM for the first time, as well as companies with CRM in place that may want to course-correct. The most critical time in the pursuit of sales is between the opportunity and quote stages, or between the front and back ends of the sales cycle. This book will give you the tools you need to successfully manage the sales process from lead to close with CRM. – Mario Franceschini-Porrata, MRF Inc.
– Joe Incontri, Krohne Inc.
6 – What’s Your Leading Indicator? Learn more or order your copy now. Already purchased ROI from CRM? Access your downloads here. 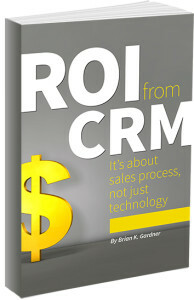 ROI from CRM is published by Modern Distribution Management. Order your copy today.